Dog Weight Loss Tips - How to Help Your Dog Lose Weight Easily? Dog Weight Loss Tips – How to Help Your Dog Lose Weight Easily? Did you know that being overweight can actually shorten your dog’s life? We’ve all been in the situation where we want to spoil our dogs and ensure their every happiness. But could we be putting them at risk by overfeeding? The answer is yes. For a dog, being overweight puts a lot of extra pressure on their joints and back. This can lead to painful strains and arthritis at later stage of their life. They are also at a much higher risk of developing diabetes, cancer and even heart disease. With this in mind, it’s clear that it’s much better for your dog to be at a healthy, manageable weight than it is to be overweight. However, we understand that it can be difficult to revert their lifestyle once it’s already gone down that route. But, just as humans can, there are many simple, natural things you and your dog should be doing to drop the weight. Research has been calling these overweight dogs ‘an epidemic’ that must be dealt with as soon as possible. It’s currently estimated that due to today’s dogs being fatter than ever before, around 53.9% of all U.S. dogs are obese (source: American Kennel Club). That is a shocking number of overweight dogs. And it roughly translates to 41.9 million obese dogs (source: Association for Pet Obesity Prevention) in actual figures. Obesity is life-threatening for humans, so of course it is for dogs too. If your dog is overweight then you are putting them at risk from a cocktail of disabling medical conditions. Cancerous tumors, diabetes, arthritis, lung disorders, high blood pressure and immune dysfunction are just a few examples of the conditions your dog could suffer from just due to them being overweight. If you maintain your dog’s ideal body weight then you will see miraculous changes in their health. Some of these changes are so important that they can actually add two years to the life of your dog. Recent studies have shown that an overweight dog is almost destined to die at a significantly younger age than other dogs. This means that just by keeping on top of your dog’s weight, managing their food better and organizing set exercise time, you can add two whole years to their lifespan. Everyone knows that dogs are man’s best friend. We don’t want to part with them earlier than we have to. Working towards your dog’s ideal body weight is just one was in which you can do that. Due to the variations in dog breeds there isn’t one universal rule to follow in checking that your dog is overweight. Some methods we use include really looking at your dog. One method is standing above them to see if their waist is obviously defined or not. It should be. Your dog’s waist should be just in front of their rear and legs. If your dog is healthy then there should be a difference in size between their waist, their chest and their abdomen. If this is particularly difficult to see then you can also do what’s known as a ‘rib test’. In carrying this out you should not be able to see your dog’s ribs. However, you should be able to feel them with some slight pressure. If you can’t obviously feel their ribs to the point in which you can count them, then it’s a clear sign that your dog is overweight. Another great technique is to check your dog’s specific weight chart. This will give you a healthy range of weights your dog should be at. You can find said charts by searching for your dog’s specific breed. These charts have been collated by professionals who have taken a wide range of dogs into account to create ideal weights from an average. Deciphering your dog’s weight at home should be a relatively easy task. However, if you are ever struggling your vet will be happy to help. They will also offer you the best advice based on your particular dog and its own medical record. This help steer you in the right direction to ensure your dog will lose the weight. Once you know your dog’s ideal weight you can start to think about getting your dog onto a diet plan. After verifying what your dog needs to cut their weight down, you must consider everything that your dog eats on a daily basis. Do an honest assessment. Make sure you include any snacks and treats that your dog will consume in one day. 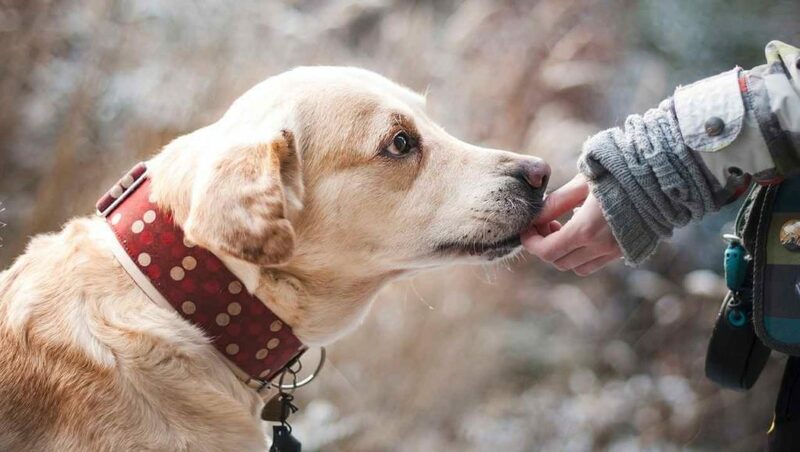 You mustn’t forget that you’re likely not the only person who will be feeding your dog. And you have to take into account any family members, friends and relatives who may was to give your dog a treat too. You need to work out the exact number of calories your dog needs to consume in a day to reach or maintain their ideal body weight. By doing this you will embark in one of the best methods for ensuring your dog’s optimal physical health. By using something called a dog food calculator, like the one by Advisor, you will be able to easily generate the number of calories your dog needs to consume. Depending on your dog’s age and general activity level will determine whether or not this method alone can be used in reaching their optimal weight. This method will give you a rough predictor of potential weight loss. However due to factors like physical activity, mobility and age, your dog may require even less calories then you thought. When you develop a weight loss plan for your dog, I would highly recommend that you take some time and plan ahead. Doing some research is important as well because you need to know which food is good for your dog breed. Once you know the good and bad you can easily decide which food to include and the ones you need to avoid. By measuring out the portion of your dog’s food before each meal, you will be able to see clear appetite changes which could be a sign of potential other health issues. By knowing and recording exactly what your dog is consuming each and every day, you will have a much better aide to work from in ensuring their weight loss. If you can, make or download a progress chart from the internet that includes weekly weigh-ins with your dog to effectively track their progress. Some foods your dog consumes now may be extremely high in calories. This is exactly what you’ll want to reduce and eliminate when it comes to planning their diet. Healthy dog snacks include green beans, carrots, celery and apples. But you must ensure you keep far away from any food that could be potentially toxic to dogs. Always remember to count treats in your daily calorie count for your dog. All in all, there should be no more than 10% of your dog’s calories that elude to treats. If there are then you will need to cut back. By using these methods your dog will lose weight whilst still eating. There is no harm for a dog to go on a diet. But there is harm in starving your dog. We really advocate the use of substitutes like carrots and apples etc. into your dog’s diet. Your dog will still lose weight whilst snacking on green beans. It’s also better than giving them something processed and covered in additives and preservatives. These are definitely some of the best foods when it comes to dogs losing weight. We know we’ve briefly already touched on food. But, as it’s such a big part of a dog losing weight, we thought we should go further in depth. To know the optimal serving size of food to give your dog you should be checking things like the food companies label information, or charts and data that they release on their website. Often you will already find a recommended amount for your dog. But if you are struggling with one food type in particular then you can always seek help from your veterinarian. They are there to ensure your dog is healthy and happy. You have to know that the label recommendations you’ll see on packaging for dog food will show you the ideal portion size to feed your dog to maintain their weight. If food and calorie intake is a significant factor into why your dog isn’t losing weight then you cannot go by their advice. First you need to figure out how many calories are in one cup of food. You can then feed your dog according to the number of calories it should be taking, not filling the bowl. You should never give your dog free choice over when they eat their food. Free choice means having food on tap and available to your dog 24 hrs a day. To them, this is unnatural and can incur a multitude of hormonal changes and significant weight gain. However, you should be feeding your dog between 2-4 smaller portions of food a day. Whilst this can be difficult, there are now things called times automatic feeders that will help you to ensure your pet is getting the correct amount of food. In buying the right food for your dog you should be looking at the dog food that shows, above-average protein, below-average fat and below-average calories. Directions: Cook the veggies by covering them with 3-4 cups of water and gently boiling until tender, and then add the oats and bran. Cover and simmer 10 minutes. Add meats and remaining ingredients except Nutramin, which is to be added before serving per the instructions for your dog’s weight. Refrigerate or freeze leftovers. Directions: Combine all ingredients except nutrients, which are to be added prior to serving. Refrigerate or freeze leftovers. Just as with humans, if a dog’s food is greater than their expended energy than there will be a large number of new fat cells formed and your dog will stay being overweight. However, by increasing your dogs expended energy by getting them up and active, you will create burned calories meaning… weight loss! Experts will advise you between 10-15 minutes of extra strenuous activity two times per day. This doesn’t mean that your dog has to come to the gym with you. It just means that you should pick up the pace in your routine daily walks, play games like fetch or incorporate other dog toys into the mix that will get their whole body moving and active. However, don’t do this rapidly! This could hinder your dog’s health rather than improve it. These changes need to be gradual and then maintained for the best interests of your dog. No-one wants to hear that their dog is fat. But for the best interests of your dog and their health and longevity, you need to know so you can tackle it and make the necessary changes in your dog’s life. Everyone has doubts about doggy diets. Is it safe to lose weight fast? What if my dog is old? The truth is, it’s never too late to make lifestyle and diet changes with your dog. If you’re severely worried then you must seek professional help in the means of your vet, who is a well-versed expert in your specific dog. Trying to cut back too much too soon on your dog’s food will cause them to become sick. By following the weight-loss charts, calorie intake methods and other immeasurable advice that is out there, you can sleep easy knowing that your dog is perfectly healthy and safe in the way they are losing weight. (1) Grooming and Health Care for your Dog – You love your dog and you want them to be clean, tidy and healthy.This page will help you do that with plenty of tips and tricks.